"MGM Grand Hotel and Casino" redirects here. For the casino in Atlantic City, New Jersey, see Bally's Atlantic City. For the current MGM Grand hotel, see MGM Grand Las Vegas. Bally's Las Vegas (formerly MGM Grand Hotel and Casino) is a hotel and casino on the Las Vegas Strip in Paradise, Nevada. It is owned and operated by Caesars Entertainment Corporation. The hotel features 2,814 extra-sized guestrooms that are 450 sq ft (42 m2) or larger and over 175,000 sq ft (16,300 m2) of banquet and meeting space. The casino occupies 66,187 sq ft (6,149.0 m2). About 75% of the rooms are in the Resort Tower which had renovations completed in 2018. The remaining rooms are located in the Jubilee Tower, constructed in 1981. Bally's is linked via a promenade to its sister property, Paris Las Vegas. On November 21, 1980, the hotel, then operating as the MGM Grand, was the site of one of the worst high-rise fires in United States history, in which 85 people died. It opened on December 5, 1973 with 2,084 rooms for the then-staggering cost of $106 million and was the largest hotel in the world at that time, and larger than the Empire State Building. It was also one of the Strip's most popular entertainment destinations. It featured two large theatres: The Ziegfeld Stage and the Celebrity Room. The Ziegfeld regularly featured productions by famed Las Vegas choreographer Donn Arden including the long running Jubilee! and Hallelujah Hollywood. Dean Martin was the starring act for the Grand Opening on December 23, 1973. Sergio Franchi was the first entertainer signed to star in the Celebrity Room (three-year contract starting February 1974). Franchi's frequent co-star was comedian Joan Rivers. The Celebrity Room also hosted such acts as the Carpenters and Barry Manilow. In May 2018 Caesars Entertainment Corporation completed a $125 million redesign of 2,052 guest rooms and suites in the newly renamed Resort (formerly Indigo/North) Tower. This recent renovation followed the completion of the Jubilee (formerly South) Tower rooms and suites in early 2014. Featured in the 1985 film Rocky IV, as the site of Apollo Creed's fatal exhibition bout against Ivan Drago. The theater, and set pieces, for Jubilee! are prominently displayed during the scene. Hosted The Late Show with David Letterman for a week in May 1987. Featured in the 1991 comedy Hot Shots!, when the pilot nicknamed "Wash Out" mistakes a runway and lands near the hotel (which features Tom Jones at the time). 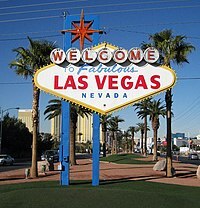 Featured prominently in the 1992 film Honeymoon in Vegas, starring Nicolas Cage and Sarah Jessica Parker. Featured in the 1995 film Leaving Las Vegas, also starring Cage and Elisabeth Shue. A head chef position at BLT Steak, located inside the hotel, was awarded to Ariel Malone, the winner of Hell's Kitchen's 15th season. Has the studio for the American version of Who Wants to Be a Millionaire? since 2016. ^ "List of Las Vegas hotel fires through the years". Las Vegas Sun. Retrieved 2016-11-07. ^ The Dallas Morning News. August 21, 1973. Dallas, Tex. ^ "Harrah's Empire News". vegastodayandtomorrow.com. Retrieved 2008-03-31. ^ "Bally's Las Vegas Finishes Room Renovations in New Resort Tower - Travel Agent Central". www.travelagentcentral.com. ^ "It's Viva Shaf Vegas as Paul Shaffer hits Cleopatra's Barge". 22 August 2017. This page was last edited on 6 March 2019, at 04:37 (UTC).